I don’t think I have ever been so hot as I was today at Nathan Phillips Square at the Toronto Outdoor Art Exhibition. It would seem that the heat wave of two weeks ago is back, and it’s not messing around this time. Home now and safely installed in my cool office, I am still feeling the after effects of the heat as my air conditioner struggles to keep the house cold against the unforgiving temperature outside. I am not yet sure that my air conditioner will win this battle. To avoid being rude, I won’t go into details of the discomfort of my heat exhaustion at the exhibit today. But suffice it to say, it was bloody hot out there. 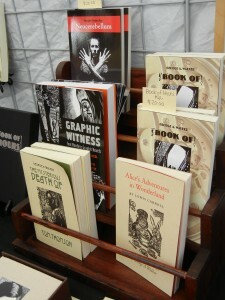 George A Walker's books, set up at the Toronto Outdoor Art Exhibition. I arrived at the outdoor exhibition just after lunch. Wandering from the subway station to Nathan Phillips Square, I saw clusters of folks coming away from the exhibition holding bags filled with recent purchases. I even saw one young women carrying a large canvas, hugged awkwardly to her chest. As I moved closer, I began to see the white tents set up in the square, each offering a small glimpse into the world of an artist. I thought it would be hard amid the crush to find George A Walker and his wife, Michelle, but they had slyly placed themselves right by the entrance, under the shade of a large cement staircase. Their booth was the first I came across, and there they were, sitting inside it, drinking coconut milk and trying to beat the heat. The tent is set up gorgeously, with George’s prints framed cleanly, rimmed with black and white matte, hanging about the space. 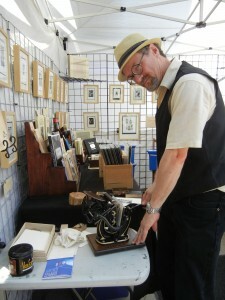 The remainder of the prints are on display in several boxes, which you can leaf through at your leisure. George’s books are set up on a lovely wooden display shelf, and at the front of the tent is George’s Chicago Sigwalt Platen press, where he is printing small cards letterpress for visitors to take away. George makes a print on his Chicago Sigwalt Platen press. After a delightful chat with George and Michelle, I headed off to check out the rest of the exhibition. There is an incredible selection of artists to be seen this year. I was especially pleased to see many paintings of the city of Toronto. One watercolour artist in particular caught my eye: Yaohua Yan. His tent holds several stunning paintings of the city, featuring red streetcars against busy city streets. As I wondered further I saw several tents displaying hand-crafted ceramics. Most remarkable were these delicate white pieces and these exciting colourful ones. 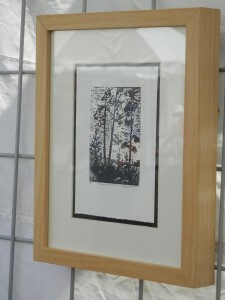 A print from the recently published Mysterious Death of Tom Thomson. All in all, there was something for everyone. I hear tell it will cool off tomorrow, so don’t miss your chance to go down to Nathan Phillips Square and check out the exhibition. When you’re there, be sure to drop by George’s tent and say hello. Until next time … Porcupette out! This entry was posted in Letters from the Porcupette (the Intern's Blog) and tagged George A Walker, The Mysterious Death of Tom Thomson, TOAE, Toronto Outdoor Art Exhibition. Bookmark the permalink.